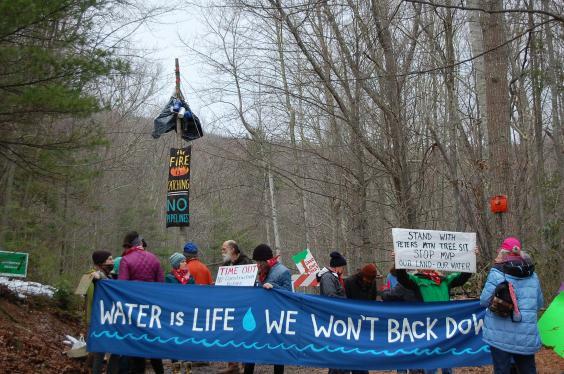 Tree pod protest against the Mountain Valley Pipeline. Courtesy of Appalachians Against Pipelines. May 11, 2018 –The Environmental Justice Committee of the National Lawyers Guild stated it condemns the actions of the United States Forest Service in denying basic necessities to a Virginia protester in violation of international law and 18 USC §2340(2)(b). The protester, a pod-sitter, with the forest name of “Nutty,” has sat in a pod since March 28, 2018, on a 50-foot pole in the Giles county section of Jefferson National Forest challenging the construction of the Mountain Valley Pipeline (MVP). The 50-foot pole is attached by guy wires to a gate on a road. MVP, having already started the construction of a 300-mile pipeline scheduled to carry fracked liquid natural gas, has commenced tree-cutting in the county in preparation for pipeline construction. The US Forest Service has closed off areas near Nutty and her pod, denying access to water protectors who support her, but more importantly, denying her food and water and subjecting her to smoke, bright lights and noise in an attempt to force her down from her perch atop of the pod. A pod-sitter has a civil and human right to life. A police duty to protect has been created. By preventing others from providing food and water, the Forest Service has created a situation where the pod-sitter’s safety and well-being are at risk under the Deshaney Standard. See Deshaney v. Winnebago County Dept. of Social Services, 489 U.S. 189 (1989). The Forest Service in conjunction with the State Police has exhibited deliberate indifference to the protector’s serious medical needs, violating the 8th Amendment under Deshaney. Under the 14th amendment, the State has an affirmative duty to protect, which arises from the limitation it has imposed on the protector’s freedom to act on her own behalf. Denial of food and water is also a violation of both domestic and International Law, including The Rome Statute, Article 7. 18 USC §2340(2)(b) expressly forbids citizens of the United States from “the administration and application of procedures calculated to disrupt profoundly the senses or the personality” and section (c) of the same forbids threats of imminent death or bodily harm. The denial of food and water and the continuing use of smoke, bright lights and excessive noise is both a threat and perpetration of bodily harm. Similarly, the denial of food and drinking water, and subjecting the pod sitter to smoke, bright lights and excessive noise has been calculated to disrupt the senses of this pod-sitter. Further, UN Resolution 64/292, passed in July 2010, acknowledged that clean drinking water is essential to the realization of all human rights. The ends achieved by several United States acts, including the Clean Water Act, the Resource Conservation and Recovery Act, and the Safe Drinking Water Act, are all consistent–that American citizens are entitled to access clean drinking water. The first line of the Virginia Constitution reads as follows: “That all men are by nature equally free and independent and have certain inherent rights, of which, when they enter into a state of society, they cannot, by any compact, deprive or divest their posterity; namely, the enjoyment of life and liberty, with the means of acquiring and possessing property, and pursuing and obtaining happiness and safety.” The actions of the state in denying medical attention, food, water and clean air is a deprivation of the protector’s posterity and her pursuit of happiness and safety. achieve the governmental ends. We believe that the Government’s objective in the continued torture of these protectors is not a compelling interest. The Forest Service may claim that the pod-sitter has the ability to climb down, receive food and be arrested. However, at this point, no agency or independent inspector has ascertained the health and cognizant status of the pod-sitter. No one knows whether she has the strength or capacity to leave the pod. If denial of food and water has already resulted in such profoundly diminished senses that she cannot cooperate to do so, the Forest Service’s actions in continuing to allow her to starve and dehydrate are tantamount to torture and contrary to International Law under the Geneva Convention and domestic law under 18 USC § 2340(2)(b) and (c). – The United States Forest Service acknowledge their liability for any injuries or deaths that result from the continued denial of food and water.